The Canadian Mixed Curling Championship gets underway this weekend at the Town of Mount Royal Curling Club. However, for the first time in Mixed history, four teams – Newfoundland/Labrador, Nova Scotia, Nunavut and Yukon – representing the bottom four finishers at last year’s Canadian Mixed in Sudbury, will compete in a qualifying round on Thursday and Friday in order to determine which two will advance to the 12-team main draw. The round robin, which begins on Saturday, November 17 at 6:00 pm ET, will be followed by three draws daily Sunday through Thursday (10:00 am, 2:30 pm and 7:00 pm), with a final draw on Friday morning prior to any required tiebreakers and playoffs. The first place team advances directly to the final on Saturday, November 24 at 2:00 pm while the second and third place teams meet in a semi-final to determine the other finalist. 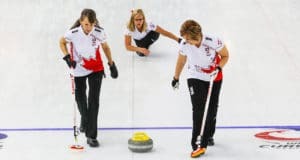 The winning team will earn two berths (two two-person teams) into the inaugural Canadian Mixed Doubles Trials, slated for March 14-17 in Leduc, Alberta, where 32 teams are expected to compete. The winner will then represent Canada at the World Mixed Doubles Curling Championship, April 13-20 in Fredericton, New Brunswick. Among the skips competing in this 50th edition of The Mixed are Alberta’s Kurt Balderston, Prince Edward Island’s Robert Campbell, Manitoba’s Terry McNamee and New Brunswick’s James Grattan. Host Quebec will be represented by skip Mike Fournier of Montreal. Balderston won the 1992 Canadian Mixed in Grande Prairie, Alberta and was runner-up last year in Sudbury, losing an extra end final to Saskatchewan’s Jason Ackerman of Regina. 2010 Olympic Winter Games silver medallist skip Cheryl Bernard will play third for Balderston. Campbell returns with his team of Rebecca Jean MacDonald (MacPhee), Robbie Doherty and Jackie Reid, which won the 2011 Mixed in Morris, Manitoba. McNamee was the 2011 Mixed runner-up and third place finisher at the 2007 edition. 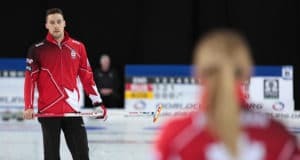 Grattan, an eight-time Brier competitor whose best finish came in 1997 in Calgary when third in his debut, will skip Rebecca Atkinson, Kevin Boyle and Jane Boyle, who teamed with Terry Odishaw to win the 2007 Mixed in Kitchener-Waterloo. Alberta and Saskatchewan lead all provinces/territories with nine Mixed crowns each, while Manitoba has eight wins. In fact, every province, plus Northern Ontario, has won at least one Canadian Mixed title since the competition began in 1964 in Toronto. Host Quebec has won one Mixed championship, that by skip Jean-Michel Menard, who eventually emerged victorious from an incredible seven-way tie for first place after the round robin in Weyburn, Saskatchewan in 2001. 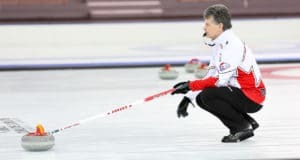 Over the years, the Mixed has been won by such other well-known curlers as Jeff Stoughton, Rick Folk, Rick Lang, Kevin Koe, Mark Dacey, Mark Nichols, Colleen Jones and Shannon Kleibrink, who became the first, and so far, only female to win the Mixed as skip, in 2004 in Schumacher (Timmins), Ontario. Saskatchewan’s Larry McGrath is the only three-time winning skip, having won the Mixed in 1967, 1968 and 1971. Draw scores/results will be immediately available on the Canadian Curling Association’s website, www.curling.ca. For the qualifying round on Thursday, November 15 at 2:00 pm, Newfoundland/Labrador (1) plays Yukon (4) while Nova Scotia (2) meets Nunavut (3). The two winners then meet at 7:00 pm to determine the first qualifier (Q1) while the two losers play to determine which one will meet the loser of the first qualifier game on Friday at 2:00 pm, in order to determine the second team (Q2) for the Mixed. See attached draw. This marks the third time that Quebec has hosted the Canadian Mixed. In 1967, it was held in Quebec City and won by Saskatchewan’s Larry McGrath. In 1990, the championship was staged in Rimouski and won by Alberta’s Marvin Wirth. Ottawa will host next year’s Canadian Mixed, November 14-23 at the Rideau Curling Club.